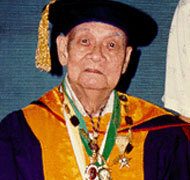 Recognized for having pioneered phytochemistry in the Philippine or his researches in the chemistry of natural products. Has done a lot of work in the isolation and elucidation of the phaeantharine and other alkaloids from Philippine medical plants. Served in various capacities at the UP for 45 years until retirement in 1965 as Dean of the College of Pharmacy. After UP stint, continued to do research at the UST Research Center and the National Institute of Science and Technology. Received Pres. Magsaysay's Distinguished Service Star in 1954 in recognition of his original experimental researches in numerous alkaloids isolated from Philippine medicinal plants. Recipient of the 1973 PhilAAS Outstanding Scientist Award. Born on 15 August 1900 in Sto. Tomas, Pampanga and died on 11 April 1990. What Did Dr. Alfredo C. Santos Invented? National Scientist Alfredo C. Santos "Father of Natural Products Research"